Several Pacific Northwest (PNW) salmonid runs are currently listed as threatened under the Endangered Species Act (ESA). This listing has already had dramatic effects throughout the PNW with the potential for more in the future. Much concern and scientific research has focused on the impacts of commercial forestry in upland, mountainous areas on river health and salmon survival. However, research is lacking on how to manage floodplain riparian areas, where agriculture is practiced in the PNW. Because of this lack of data, and the immediacy of action required by the ESA listing, regulatory agencies are considering the use of upland riparian data to guide rule-making decisions for downstream agricultural riparian areas. If wide buffers currently being discussed are applied to all fish-bearing or potentially fish-bearing streams and ditches, the economic viability of PNW agriculture could be at risk. Much of the productive land could be lost to the buffer outright or impacted by field fragmentation, shading and biotic influences (e.g., harboring insect pests/disease). In response to these issues, we are examining the environmental and economic implications of establishing and managing riparian buffers on agricultural lands. Riparian buffers are considered to be good land stewardship because they conserve soil, provide fish and wildlife habitat, and improve surface and ground water quality. However, scientific literature on riparian buffer function and design is limited for low gradient streams, rivers and associated floodplains and non-existent for western Washington soils and climate. The overall goal of the project is to identify what constitutes a functional riparian buffer to protect water quality and improve salmon habitat, and to determine the economic impact of such buffers on farm enterprises. 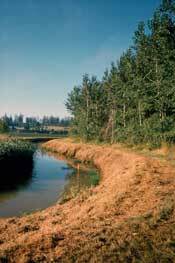 To determine the effects of buffer width, species composition and management on buffer function including nutrient removal, sediment reduction, shade, and bank stabilization. To conduct economic impact analysis of different riparian buffer designs on individual farm enterprises. To develop and disseminate buffer recommendations and decision-making tools to owners of farmland along watercourses in western Washington. Partial funding for these projects has been provided by grants from the Rural Technology Initiative, the USDA Sustainable Agriculture Research and Education (SARE) program, the WSU Safe Food Initiative and the Washington Department of Ecology (Ecology) Direct Implementation Fund.